It’s been known for years that the Andromeda galaxy would collide with the Milky Way, two of the largest galaxies in the Local Group, in about 4 billion years. However, because of stellar distances, it’s a good probability that a lot of the stars will remain intact in the tumultuous merging. The Solar System would probably get pushed to the outskirts of the newly merged galaxy. Researchers reported their conclusions in an upcoming issue of the Astrophysical Journal. Astronomers have been painstakingly tracking the motion of Andromeda using the Hubble Space Telescope between 2002 and 2010 to verify this finding. Andromeda, roughly 2.5 million light years away (770,000 parsecs), is the nearest large spiral galaxy to the Milky Way. 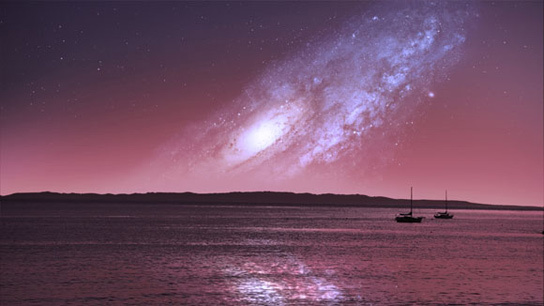 The scientists were able to extract dynamical information about Andromeda that was hidden from astronomers for a century. It’s been decades since astronomers have known that Andromeda has been moving towards the Milky Way at approximately 110 km/h and that the two might eventually collide as a result of their mutual gravity. However, astronomers hadn’t been able to determine whether the collision would be a major merger, a near-miss, or a glancing blow. Thanks to Hubble, astronomers have been able to determine Andromeda’s sideway motion. The merger of Andromeda and the Milky Way is inevitable. 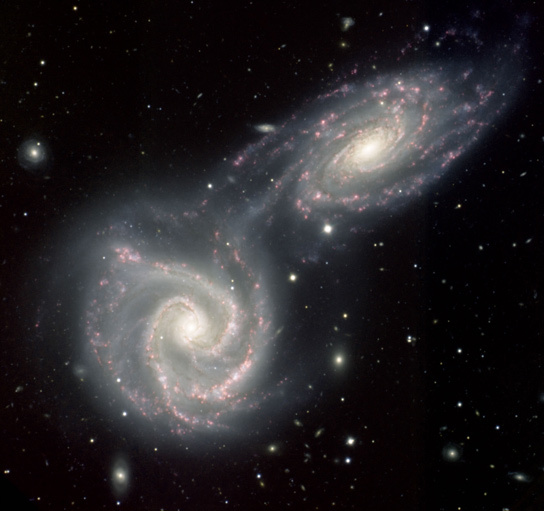 After the collision, it will take another 2 billion years for them to form single unified galaxy. The key to understanding the measurement was the evolution of the Local Group, among which Andromeda and the Milky Way are the most massive galaxies. The new simulations based on Hubble’s data allowed the astronomers to run the simulations backward and forward. There is a 9% chance that M33, a satellite galaxy of Andromeda, will hit the Milky Way before Andromeda does. The Milky Way-Andromeda collision will move the sun away from its current position at 26,000 light years (8,000 parsecs) from the galactic center to more than 160,000 light years (50,000 parsecs) away from the center of the newly merged galactic bodies. 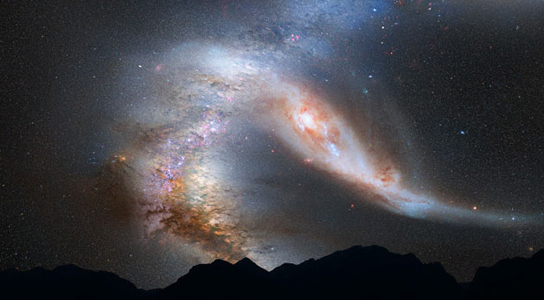 Be the first to comment on "Milky Way-Andromeda Collision on Course in 4 Billion Years"